The San Francisco Bay Area web design firm Project6 Design is proud to announce the launch of a new website design and development project for the Gordon and Betty Moore Foundation. 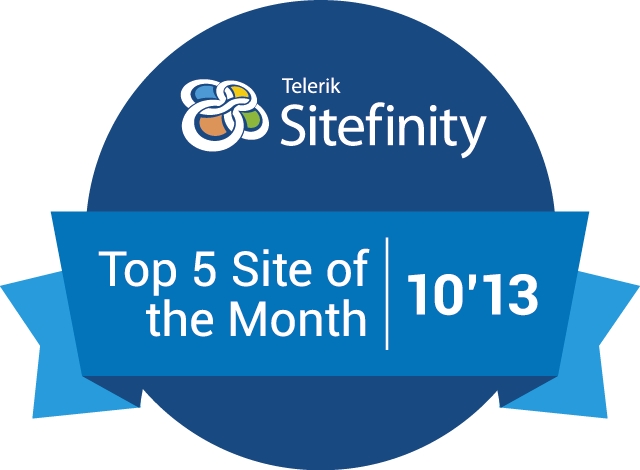 The new website, featuring a modern, compelling user experience and a bold design, was built on the Sitefinity content management system (CMS), and was quickly recognized with a Sitefinity Top 5 Site of the Month award. Project6 Design, a San Francisco Bay Area web design firm, is proud to announce the launch of a nonprofit responsive website design case study for the Gordon and Betty Moore Foundation. One of the largest foundations in the U.S., the Moore Foundation tackles some of the world’s biggest challenges in environmental conservation, patient care and science around the world and at home in the San Francisco Bay Area. Project6 Design conducted discovery sessions with key stakeholders to understand in detail the foundation’s work and target audiences, and then designed and developed a bold, fresh experience for the site that expressed the true personality of the Moore Foundation brand. The website was built on the Sitefinity content management system, allowing the Moore Foundation to have full control over the content and enabling them to link to their internal grants database. The development also utilizes the most up-to-date coding methods including HTML5 and CSS3. 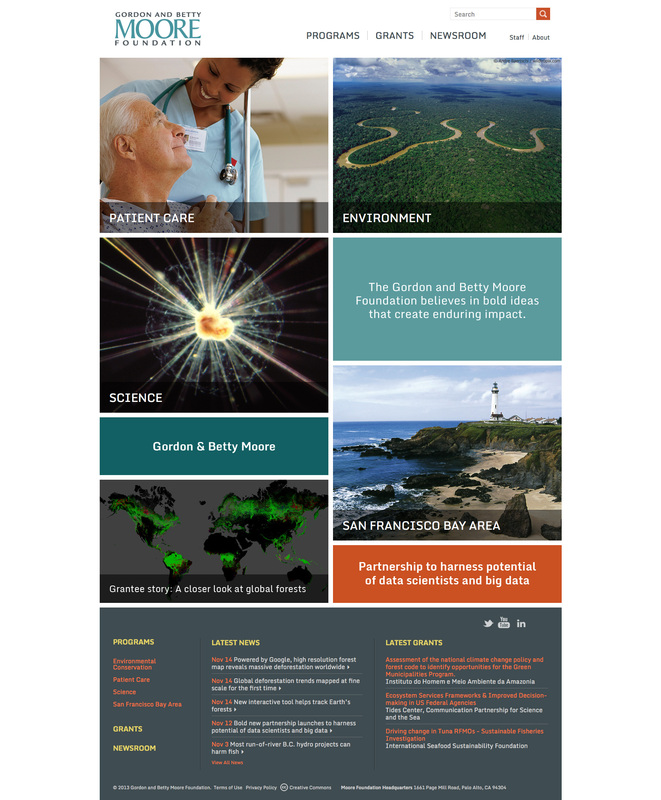 Established by Intel founder Gordon Moore and his wife Betty, the Moore Foundation is committed to collaborating with its partners to apply the bold thinking that can create an enduring impact in the areas of science, environmental conservation and patient care. But its the foundation’s website had not grown with the times—literally or figuratively. Built to be only 800 pixels wide, it failed to generate excitement, lacked a vibrant personality and offered little incentive to learn more about the work of its grantees. Their online presence simply didn't reflect the Moore Foundation’s passion or vision for change. Project6 sought to engage site visitors—including partners, job seekers and board members—with Moore Foundation’s core programs and initiatives and the people who are making them happen. Rich images and insightful program statements rivet visitors’ attention on the main page. The navigation’s easy-to-use menu allows readers to quickly drill down into topics of interest or discover details on more than 1,500 grants. The bold, spacious, image-filled design translates seamlessly to all size mobile devices. The resulting website illuminates the passion of the Moore Foundation’s most important asset: its people and partners. Through clear, inspirational storytelling, visitors are emotionally and intellectually drawn to the causes that Moore Foundation supports. And easy-to-find information makes it possible for visitors to identify ways to collaborate on this work and connect with Moore Foundation staff. The Gordon and Betty Moore Foundation believes in bold ideas that create enduring impact in the areas of science, environmental conservation and patient care. Intel co-founder Gordon and his wife Betty established the foundation to create positive change around the world and at home in the San Francisco Bay Area. Visit us http://www.moore.org or follow @MooreFound. Project6 Design is an award-winning web design firm working with university, foundation, high-tech, and retail clients. Known as one of the best web design firms in the San Francisco Bay Area, their unique design and development process engages visitors and drives business results. Services include branding, marketing collateral design, web design, and custom development. Clients include eBay, Gap, Stanford, CA Technologies, Old Navy, The Siebel Foundation, UCSF, and many others. For more information: (510) 540-8005, email info(at)project6(dot)com, http://www.project6.com, or follow @P6Design. Gordon and Betty Moore Foundation website home page - designed and developed by award-winning San Franscisco Bay Area web design firm Project6 DesignThe new website home page for the Gordon and Betty Moore Foundation created by Project6 Design The new website for the Gordon and Betty Moore Foundation created by Project6 Design was honored with a Sitefinity Top-5 Websites of the Month awardThe Gordon and Betty Moore Foundation website, designed and developed by Project6 Design, was quickly recognized with a Sitefinity Top-5 Websites of the Month award.